Sergei Prokudin-Gorsky. 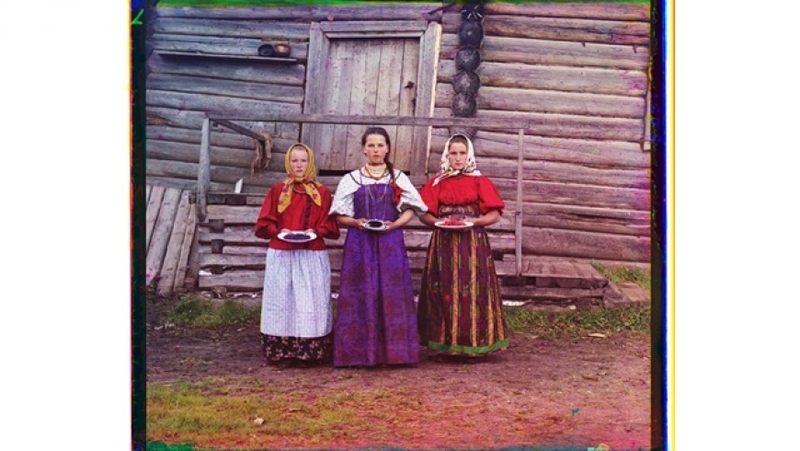 Peasant girls, Russian Empire, 1909, Courtesy of the Library of Congress, Prints & Photographs Division, Prokudin-Gorsky Collection, Washington D.C.
Close and Far is an exhibition centred around the recently rediscovered works of Sergei Prokudin-Gorsky, an early pioneer of colour photography who was commissioned by Tsar Nicholas II, the last tsar of Russia, to document the vast and varied empire he presided over. The result was an extraordinary graphic encyclopaedia of pre-Revolutionary Russia. Today, Russia is still a land of dramatic extremes. Where Prokudin-Gorsky witnessed the effects of Russian imperialism first-hand, contemporary artists are working in the aftermath of the collapse of both the Romanov and the Soviet empires. Close and Far presents recent photography and films by artists whose work explores the subject of identity and place in post-Soviet times. Close and Far has been curated by Kate Bush.